Area 7-2 is the second course of Cannon Cove and the fifty-sixth course overall in Mario vs. Donkey Kong: Mini-Land Mayhem!. 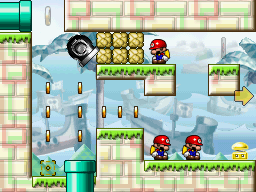 Two Mini Marios begin at the bottom center while the other begins in an alcove at the top center, with the exit door on the middle right. In order to reach it, they must simply be guided via a series of Cannons, Long Springs, and Warp Pipes to it. The M-Token is located at the top left, right next to the azure Warp Pipe entrance. To collect it, the Mini Marios must simply use the Cannon closest to it (by firing out of the Cannon close to the Mini Mario Card) and fire down to the other azure Warp Pipe entrance. The Mini Mario Card is located near the top center, to the right of a set of Rock Blocks. The bottom Mini Marios must simply enter the yellow Warp Pipe closest to their starting position and fire left out of the Cannon that the Warp Pipe leads to in order to reach it. In Plus Mode, the two Mini Toads must be guided to the exit door first, followed by the Mini Peach.